Fall 2019 Sessions Begin in September! R ocky Mountain Conservatory Theatre is excited to announce our Winter/Spring 2019 session of Acting Classes for children ages 5 to 18. We recognize a hunger for intensive and dynamic training programs for children and teens interested in theatre arts, and look forward continuing to provide the best performing arts programming to the South Florida youth community. This year, we are thriled to announce Winter/Spring 2019 Conservatory Classes with our study of Shakespeare's "Twelfth Night". Our students will continue learning and to keep expanding on the concept of acting and character development. Conservatory is the place for the aspiring actor to develop a reliable process of working in film, television, and theatre. This is our 6th year of working with young artists, and we have never been more motivated to help bring the new actors in our organization into the professional world of acting. We have had many successes over the past 13 years, from helping my young students transition into professional theatre, land major roles on television shows and leading roles in film, finishing our first workshop of our original television show, 'The Big Audition', to sending off our latest graduating seniors to university, many on acting scholarships. Our Artistic Director has been teaching for 25 years, and in this time, he has developed a successful strategy of reinforcingthe mindset that the foundation for a serious life as an actor starts with training in classical theatre. SHAKESPEARE!!! This is our focus for this session of conservatory. I will help every student realize how crucial Shakespeare is to creating a successful life as a professional actor. When you learn to act verse, you can act anything. Nothing is too complicated when you understand how to create character through Shakespeare’s verse. We will work on Twelfth Night, one of Shakespeare’s most famous plays and when the students finish with this 10 week abridged version, they will be emotionally and intellectually transformed. Actors Conservatory Class will focus on our acclaimed intensive Actors Conservatory Program, designed to foster the young actor's creative process. It is a course for those who aspire to be future professional actors. We provide Conservatory training, with focus ranging from Shakespeare to Sondheim (as the class is named aptly on the focus of the work), to movement to vocal exercises to stage combat and more. Individual classes will examine emotional truth, process, and scale for the stage. Conservatory's purpose is to prepare young actors for being confident in their role on stage while learning how to embody their character. 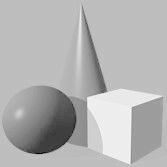 It is crucial to understand that those who aspire to professional status cannot grow without regular application of the above. Conservatory training is an ongoing process; its purpose is to prepare young actors for the stage, film, and TV. All students enrolled in this class will be equally involved in the play with a speaking role worthy of one’s skillset. **A performance of "Twelfth Night" will take place during the final class on Monday, April 22nd. Conservatory has proven to be a very beneficial class for our young adult students. There are many success stories of students who have trained with Anthony Hubert, our Artistic Director, who then enter the professional world with the skills necessary for achievement as a well qualified actor in the business. Each year we choose a challenge for the students to sink their acting chops into, with a showcase in April at the end of our academic year. We find that Shakespeare as a foundation for growth in the work accelerates our students' understanding of the artistic process, propelling them to unbelievable heights in their work. This year's Conservatory Class will be special, for we have students in their sixth, fifth, fourth, third, second, and first years of training. All are the right place to start! This ensemble is ready to take a professional leap. Come and be a part of this exceptional work. It will change your life forever! Taught by RMCT's Founder & Artistic/Education Director, Anthony Hubert, who has over 25 years of experience including many spent as a Professor of Theatre in several Universities. This class is appropriate for both students who are new to acting, and for those who have taken Conservatory in the past - this class is never a repeat! This year, we are thriled to announce Winter/Spring 2019 Conservatory Classes with our study of a variety of popular Broadway plays and musicals of itnerest to our youngest actors. Our students will continue learning and to keep expanding on the concept of acting and character development. 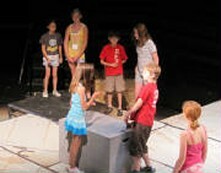 This fun Class is for the creative child who is determined to be on stage. Successful actors and performers start off on the stage learning how to be comfortable in their own skin so that they can begin to play the roles of other people. Our students learn that the creative process is not exclusively for some mysterious group of humans, but rather it is a simple and fun filled skill set that everyone should learn. We start the Class with creative dramatics, and by teaching students a number of exercises and games to help them get over the fear of performing in front of others. After we create this safe environment in which to explore, we begin skill building and creating characters for the stage. 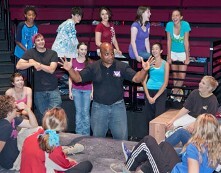 Acting 101 Class is magical, fun and necessary for every young actor. All students enrolled in this class will be equally involved in the plays/showcases with a speaking role worthy of one’s skillset. **Each Student will perform in a showcase during the final class of ech 5-week session, so 2/25 and 4/22. WINTER SESSION - Creating Masks for Performance: We start this Class with creative physical comedy and mask work. Yes, we will be making masks out of plaster and found objects, using the masks to create character and performing on stage with new found mask and movement skills. Working with mask truly helps the young student to manage and get over the fear of performing in front of others, and too, teaches leadership skills needed for public speaking. 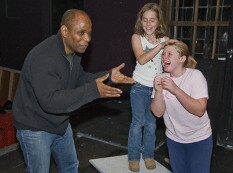 After we create a safe environment in which to explore, we begin skill building and creating characters for the stage. We apply the character work in scenes appropriate for the student’s age. Finally, after five weeks of training, we will have a showcase of the work that we explored in class to celebrate new found skills by our young actors. SPRING SESSION - creating a show from scratch: We start the Class with creative dramatics which include introducing the young actor to the idea that stories are everywhere and that performing on a stage is the literal version of storytelling. We begin by teaching students exercises and games to help them get over the fear of performing in front of others. After we create this safe environment in which to explore, we begin skill building for creating characters for the stage and we show them how that character progresses as their stories progress. We apply the character work in a story created by the group. Finally, after five weeks of training, we showcase the new play created to celebrate their newfound skills. *We will also be incorporating popular childrens musicals into these two class sessions, where students chose and perform in scenes from some of the most beloved children's musicals such as Matilda, Alice in Wonderland, Beauty & the Beast, & More! Taught by RMCT's Founder & Artistic/Education Director, Anthony Hubert, as well as our Max Fabian and Valentino Valentine. This class is appropriate for both students who are new to acting, and for those who have taken Acting 101 in the past - this class is never a repeat! After two to three years of Acting 101, the student is usually ready to continue their training in Actors Conservatory Class. Location: Beginning this Fall 2019, More Details T.B.A. Contact RMCT with your interest NOW to be the first to know about our upcoming Adult Acting Series! All enrollment and forms are to be completed during the online registration process. * Note: Class tuition is NON-REFUNDABLE and must be paid in full on or before the first day your child attends class. If you are paying in person, please contact the City in advance to check for availability first. *Since this is an ongoing class schedule, your child may begin after the first day of scheduled classes (check with the us for pro-ration discounts). Please contact the RMCT to confirm space availability.